This first Australasian son of English import NZ CH Sheltrice All That Jazz was a singleton puppy, hence his call name (Lone) Ranger. His showiness reminds me of his mother Mabel,CH Norwester Golden Bay Babe,(see profile),while his superior movement is typical of his sire. Starting with Baby in Groups at Forrester Park, and The Plains (Ray Greer), Ranger really came into his own at the Nationals in Auckland, at nearly five months of age, with BOB over several mature dogs, and Baby Puppy in Group under Dr Wilfrid Peper of Germany, and 7th in the Puppy Stakes under Mrs Dianne Tyssen, Invercargill. Dr Peper (a Norfolk breeder) had many complimentary things to say about Ranger's hind movement, and balanced angulation front/rear. It was great to hear the opinion of an overseas specialist breeder-judge, who has judged many examples of the breed. Ranger was Baby Puppy in Show at the West Coast KA, under Group judge Mrs Esther Joseph and In Show judge Mrs Sandra McMahon. 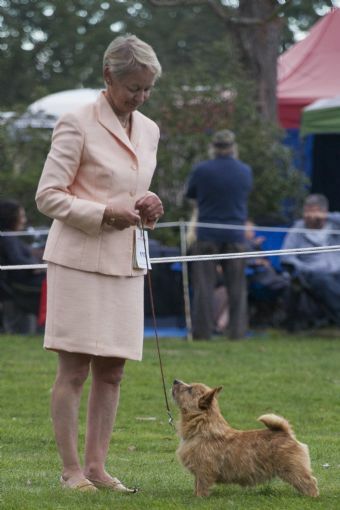 Ranger won Puppy in Show at the Waikouaiti KA show 14Feb 2015, under Canadian judge Thomas Nesbit, after age class in group win from Jan Brownlie. 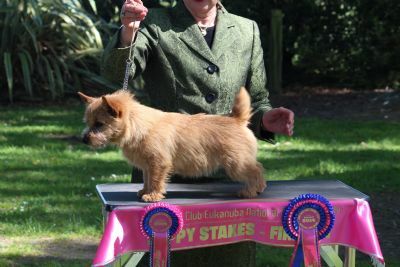 More Puppy in Groups at Ashburton and Canty Ladies, then a 2nd in the Margaret Spivey Memorial Puppy Stakes at North Otago, judge Suzanne Foster had a hard choice from 35 lovely entries, many of them multiple winners at In Show level. At Buller, Ranger won Reserve of Grp under Australian judge Colin Seymour, & Puppy of Group (Jill Hocking, Victoria).At Geraldine on 28 March Ranger was Best In Group under Australian judge Miss M. Davis, a great thrill. The following weekend he scored a Reserve of Group under NSW judge Gary Dryburgh, and Puppy of Group under G. Krishnan, Malaysia. Nelson Ladies saw another puppy in group (judge D. Wilson), and second Puppy in Show win, this time under Kerry Cannon, NSW. 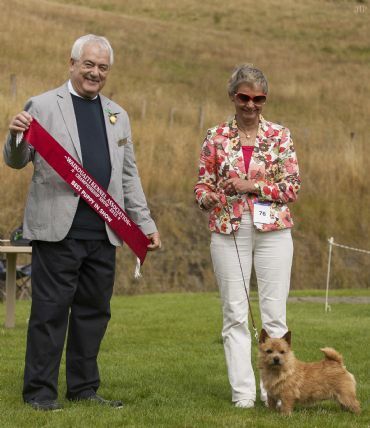 Ranger was Canty Combined Terrier Club Reserve Show Dog 2015, winning Baby Puppy as well as Puppy if the Year. 28-Mar-15 Best of Group, Puppy of Group.